One of three sessions to proceed the opening ceremony at this years Kendal Mountain Festival, inov-8 hosted a fell running session on their home turf, a stones throw from their Lakeland base in Staveley. This was to be the only main session I could attend at this years festival, due to other commitments and I’m going to throw in a spoiler from the start. I’m really glad I made the effort to travel. With 4 main speakers and a quiz with prizes to be won, it catered for all and the short interval 2/3rds of the way through gave a chance for glasses to be refilled with real ale and one hell of a headline act to take to the stage. Fell runners will know Adam Perry for a number of reasons. It may be his win at Fellsman and other long distance events, it could even be his boyish good looks; but what he is most known for is his attempts at the Lakeland 24hr record. Beyond the Bob Graham, the 24 hour record is simple, bag as many peaks in 24 hours. And that is where the simplicity abruptly ends. If you thought 42 was a tall order, try 78, the required number to break the current record of 77 held by Mark Hartell. Adam, by his own admission didn’t start out as a runner, but this obsession has grown, so much so, on 4 occasions he has subjected himself to what many may say is the ultimate fell running challenge. Taking us through his history of attempts, what he learnt, where mistakes were made, he recalled his most recent attempt, showing the leg details to a stunned crowd, held in awe by the sheer volume of peaks, mileage, ascent and minimal time between all. The agonising story of being one mile from the finish line, with the required extra peak secured, only to be timed out sent gasps around the theatre, with Adam’s response of one line saying “Just Didn’t Do it” summing up his feelings and the message he delivered, you should be happy with the day you’ve had, you tried your hardest. I’m not ashamed to say I wasn’t aware of Helene’s achievements till this very evening. Though fell and endurance running aren’t entirely new to me, the history and progression of the sport are areas I do lack a depth of knowledge and Helene’s story and C.V were a real eye opener. Now I could copy of a list of achievements such as her 1977 Bob Graham Round, 167 mile run from Everest Basecamp to Kathmandu, 1988 Mount Cameron Race, 1989 Bob Graham, Paddy Buckly and Ramsay Rounds all in the same summer….. and the list goes on. However, this would not give real context or meaning to what they represented at the time and more over, their significance. For instance, the Everest Basecamp run was unsupported. The maps were blue; roads/paths/rivers/contour lines, you name it, were all blue and to add a sting, contours in the himalayas are 100 meters in height difference. And yet, Helene completed the 167 mile run in 3 Days, 10 hours and 8 minutes, taking 24 hours off the previous outright record. Unsupported, out right win, day and night difference in completion time and without sponsors paying for flights, accommodation etc. When she set the then Bob Graham record of 20 hours and 17 minutes, Helene did so unsupported and solo. Leaving cards at road crossings so any potential rescue would know where she last got to, it also meant carrying a bivi bag, as by her calculations, it could be a good 12 hours plus before a search party would find her. I could go on to detail about the outright Dragon’s back win in 1992 and further achievements, however what came through was doing it for yourself. Run because you want to, be competitive and don’t think any less of being female. Fell running is one of few inclusive sports which allows both genders to start on the line together and long may it continue. In longer races (looking at ultras or long distance mountain/fell) women are winning outright in increasing numbers and for this to continue, we need young women to feel they can be competitive and should follow their passions. Rounding off Geoff’s trilogy of fell running films, Trail Pike, premiering at Kendal Film Festival follows the creativity and art that originated from setting himself a monster challenge to mark his 60th birthday; The Bob Graham, Joss Naylor Challenge and Jerry Charnley Round. Starting off by stating “They said wear a vest; fat lads at the back don’t get a vest so I couldn’t” any difference in performance to the likes of Ben Mounsey and co, was quickly removed with the art that graced the screen. 3 shorts, each following a different round, narrated by Geoff’s poetry really gave different perspectives, emotions, character to the mountains and above all, a refreshing breakaway from fancy drone shots, leaping down slopes and a sound track. It felt raw, unfiltered and true. Geoff’s passion for fell running, the inclusivity it brings and perspective it gives all who undertake and follow it, raised the audience. Everyone loves a quiz, especially when there are prizes at stake. As Ben Mounsey explained that the map loving, Strava segment craving type would be in their element, that their entire life had built up to this moment…. most of the crowd were in silence, as the sinking realisation they didn’t stand a chance sunk in. The format was simple (and I forgot to get a shot of the question), the black outline of a fell route taken from a Pete Bland map would be shown on the screen. Be the first to shout out the correct answer and a prize was yours. Carnage! As famous races were randomly shouted out and one gentlemen repeated “Blencathra” for every round, it was clear who knew their maps… not many sat in the main theatre at the Brewery Arts Centre! 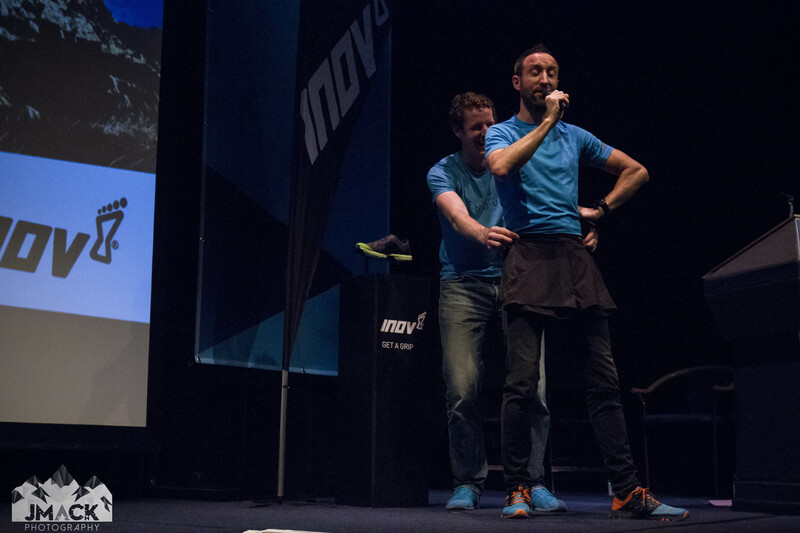 The threat of hot pants was ever present and with a final round, Ben expertly modelled inov-8’s finest. There aren’t many names which carry as much significance in the fell running community as Billy Bland, current Bob Graham record holder, dominant force in the 80’s and co founder of the legendary Borrowdale Fell Runners. Henry Hunter and Ella Parks of Helm Hill were the interview panel for the fell running legend. The questions delivered opened one of the most honest, sincere and direct round of answers on offer. With an audience laughing contagiously, the quick whit of Billy was ever present. Having started running through his father and two bothers, life was a race for Billy, full of competition and as he pointed out, you had to get your snout in the trough at dinner. Spending his entire life in Borrowdale, the fells of the valley provided the perfect training ground and found a lot of the races to be too short. His cousin Chris suggested the Bob Graham and with 2 others, they set out to run it together…. However, after Threkeld, this began to fall apart. Chris was encouraged to speed up by Billy’s fatter brother and Billy ended up finishing on his own in 18 hours. To put some of us mere mortals at ease, he came last in his first race at 17 and believes we are more capable than what we give. Setting out to win is vital, whether racing or training, it comes down to commitment and the will to succeed. When asked whether his Bob Graham record will be broken, the answer was to the point. Yes. It has stood for too long and there are many capable. We know more about nutrition and training then ever before, and yet we aren’t faster. Much like an IMdB page it would be all to easy to fill the report with brilliant one liners, including road marathons, backsides and holes…. Leaving the stage to a standing ovation, those who were there to witness the humour, wisdom and whit knew it was a special night. The inov-8 Fell Running Session is one of my favourite, if not, best session I have been to at Kendal Mountain Festival in the past 5 years. Humour and humility were present in all talks and as a running fan, it only grew my passion for the sport and desire to spend more time in the fells. Despite the variances in fell running achievements, strengths, presenting styles and motivation, all speakers worked seemingly in unison, delivering a night of tales from the Fell. A classic, you had to be there moment which will go down in the history books of Kendal. Great read, really enjoyed it ! !